Did you know that three quarters of children and youth say they have been bullied, teased, or felt left out? Bullying often begins between the ages of 4 to 11 years, and if not prevented, continues into adulthood. Bullying is a community-wide problem occurring throughout Renfrew County – at home, in school, at work, in the community, and online (cyber bullying). It affects individuals, families, school and workplace environments, and social groups. Bullying not only interferes with the well-being and development of individuals, but also the development of a healthy and inclusive community. Bullying must be addressed by adults, youth, and children who recognize the problem and who are willing to step up and stop it. But how? 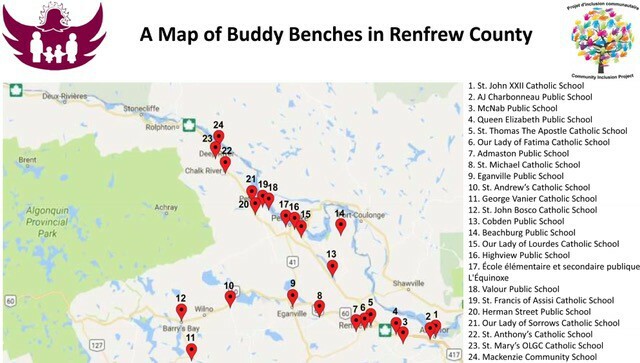 In 2014, the United Way of Renfrew County funded the piloting of a new way to approach Bully Prevention and Community Inclusion through a multi-sector, multi-pronged approach. The Deep River and Area Inclusion Project (DRIP) was born. We developed a committee, a template, and an action plan to make a difference in the Deep River community. In its second year, DRIP is thriving as the community increasingly demonstrates a determination to create inclusion in different areas of life, home, community, school and work. In 2015, with the United Way’s generous support, we were able to build off of DRIP to create the Petawawa Inclusion Project (PIP), an evolving program that is unique to the needs of Petawawa, involving a large military population. We are collaboratively planning a wide range of innovative projects, activities, and strategies to create more accepting and inclusive communities. These include workshops in schools and workplaces, partnerships with sports organizations and the promotion of various special events. In 2016-2017, we continued our work to promote and to raise awareness at special events, put together Toolkits for educational professionals, and expanded our membership to involve as many people as possible, whom support inclusion for all. Our goals for 2017 include continuing to educate and raise awareness about the importance of inclusiveness, assist in the process of bully prevention, and continue to expand our project to other welcoming communities. The Buddy Bench can be used as a simple and effective tool to help foster inclusion, kindness, friendship, and empathy in the school systems as well as the whole community. This Toolkit is an educational resource for principals, teachers, educators, parents, etc. to use in implementing a Buddy Bench. Download the free materials and start your own initiative! Check out what we’re doing to help out! Follow us on Facebook to socialise and for the latest news.